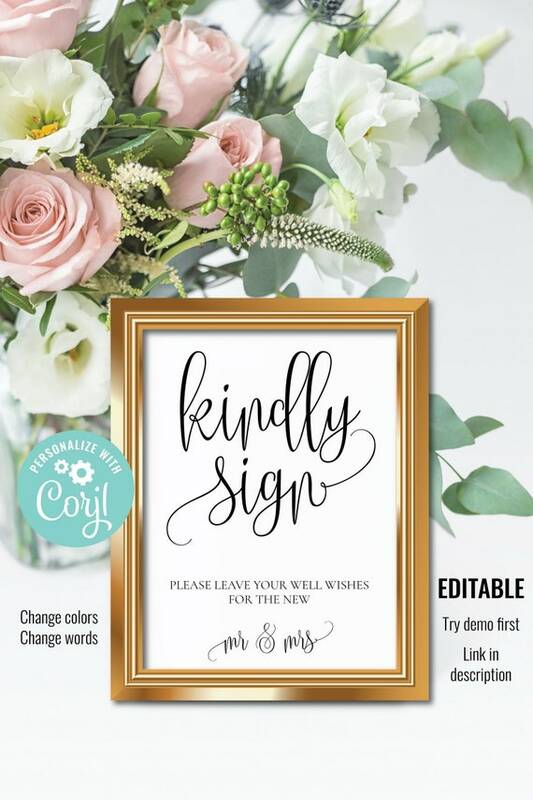 Accentuate your wedding reception with an printable guest book sign! This wedding sign measures 8" x 10" and ideal for framing to display. This sign is an instant download. You edit online and print today. This sign is very versatile, change the text color and wording easily. Editable signs are ideal for weddings, Bar or Bat Mitzvahs, baby showers, retirement parties and more. ♥DEMO♥ Try before you buy, simply copy and paste the link below into your browser window. EDIT AND PRINT YOUR SIGN TODAY! JPG file (single image) is typically printed at any photo lab processing center (Walmart, Costco, VistaPrint, Shutterfly.com, or mpix.com) You may also use a JPG file for social media.